UFO SIGHTINGS DAILY: UFOs abduct 1,500 sheep from a field in Lincolnshire, Aug 2016, UFO Sighting News. UFOs abduct 1,500 sheep from a field in Lincolnshire, Aug 2016, UFO Sighting News. Animal abduction and mutilations are nothing new around the world, and are still commonly seen, especially in South America region, but here we have 1,500 sheep the disappear together which is very odd indeed. For a UFO to take them, it had to be huge, unless it had some kind of shrinking technology to transport things more easily. This should be of national importance to the UK and needs deeper investigation into it. 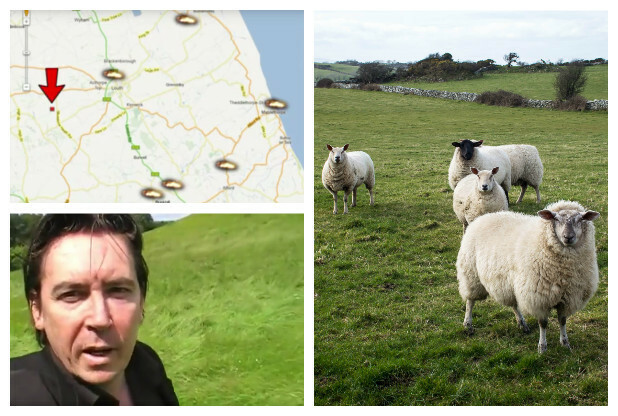 A documentary film maker has questioned whether the disappearance of 1,500 sheep from a field near Louth was the result of UFOs. Footage, uploaded to YouTube by an account called dot luter, has investigated possible UFO sightings across the East Lindsey area with one witness claiming to have seen a huge spherical object hovering in the sky at Alford. The 1,500 sheep mysteriously disappeared from the field at Stenigot overnight in September 2011. No one in the area claimed to see or hear anything. Arrests were made at the time in connection with the disappearance but the documentary footage claims no one was ever charged or prosecuted. In the documentary, UFO spotter Eric Goring from Brinkhill, told the video he had seen hundreds of sightings of what he called "the black triangle" not far from the area at the time. He said: "I saw these white or orange or yellow balls of light which turned out to be the black triangle. "They were out on the fields going round and round lit up bright and then when they got closer I could see the black triangle. "I've seen the black triangle hundreds of times and up to 40 in one night." Mr Goring said the triangular objects were around 30ft long on each side. "I have seen them come down to the ground at thousands of miles an hour. They come straight to the ground, they loop out and then go up again. "It floats and it makes no noise," he said. "It was very dark, no luminosity, but it had legs and there were lights just above the legs." Taxi driver Morag Taylor, from Alford, told the video maker she had once seen a similar triangular sighting on a drive from Skegness to Louth in the early hours of the morning. She said: "There was a thing hovering in the sky with lights, it was too big to be a star. "Then it just shot away at speed. I thought it was much faster than a Harrier jet. "It was quite low - probably about three storeys high. "It was quite big, probably the size of an articulated lorry. "It was very dark, no luminosity, but it had legs and there were lights just above the legs. It was triangular." Another witness who spoke on film, said he once saw a huge spherical object in the sky while he was driving between Alford and Mablethorpe. He said: "I came round a corner and my little girl, who was in the back, screamed. "The car in front stopped. There was a grey, egg shaped thing. "I would say it was three times longer than the width of the road. "It was stopped right above the road. It was absolutely huge, bigger than a plane. "All of a sudden it shot back in the opposite direction it came from." The documentary maker said he believed the alleged sightings could be linked to the disappearance of the huge number of sheep. He said: "I don't think any open minded person would doubt there is something perculiar going on in the skies near this sparsely populated area."